Though we see plenty of big ideas surrounding the future of urban planning, the steps to make our cities smarter are often more incremental. Touch-screen kiosks pop up on street corners, cycling through advertisements and beaming out public Wi-Fi. These quickly become part of the landscape for unfazed city dwellers, but who thinks about their functionality behind the scenes? Boston-based startup Soofa has been equipping urban centers with smart furniture since 2014. The company began with a bench that harnesses solar energy to double as a phone-charging station. The new Soofa Sign is more akin to those familiar kiosks, but unlike others, it uses electronic paper. Though it’s solar-powered and connected, its design very intentionally recalls the old-school community bulletin board. 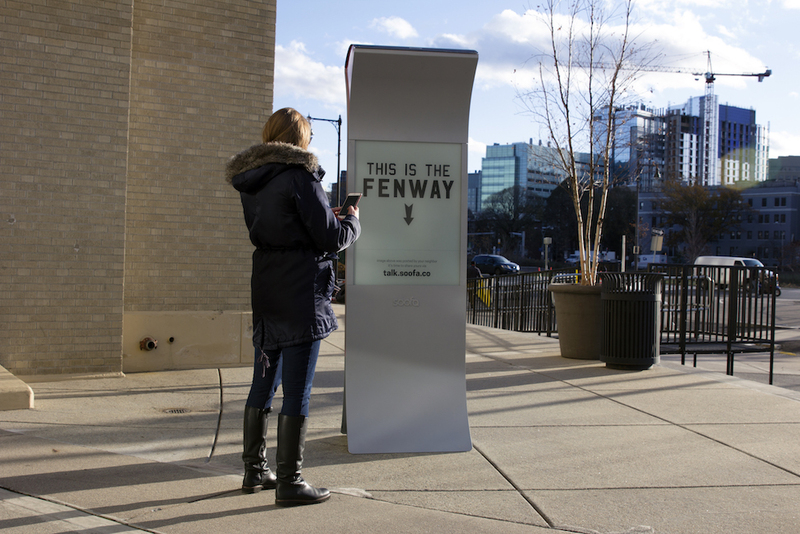 Both products can measure the traffic in public spaces, which Soofa analyzes for clients to fuel a hyperlocal, data-driven approach to retail and advertising. PSFK spoke to co-founder and CEO Sandra Richter about Soofa’s user-centered approach and the urban experience. Where can we find Soofa out in the world, and what are some of the use cases for it? Sandra: You can find Soofa out in the wild in 75 cities in the U.S. and two other countries that are very dear to us—one of them is Germany [where I grew up]. You can find Soofa anywhere where you can find people. 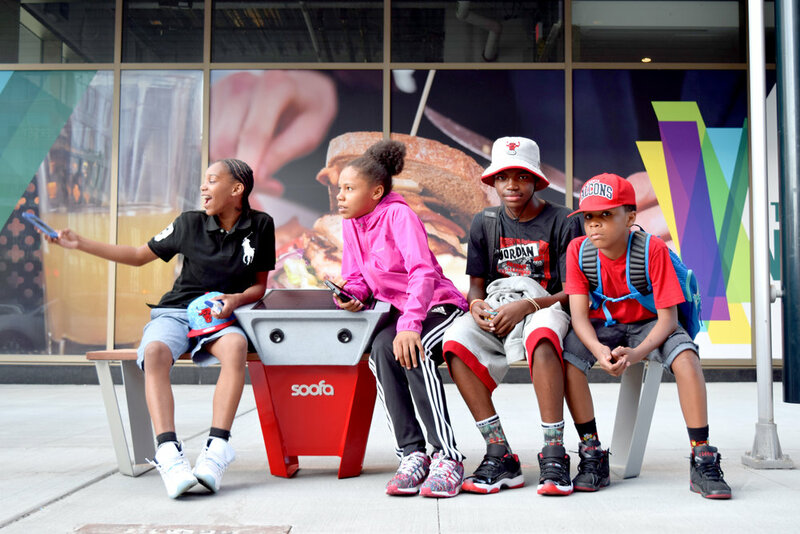 The Soofa Bench loves being in parks or at bus stops. In New York, you can find Soofa Benches, for example, at Highbridge Park [in Washington Heights]. The Soofa Sign, which is our newest, off-the-press product, you can find in Boston, Atlanta and Las Vegas. Those are our first three early adopter partners. We had cities apply to become early adopters of the Soofa Sign and they were the three selected cities. Boston, obviously because it’s our hometown, so they had a bit of hometown advantage. But Vegas actually, in the downtown area, is really fast-growing. They’re really looking into how can they create space that brings people together, how do they build walkable communities in a place that’s technically not known for walkability. So we thought that was super interesting, and we’re working there with the public transportation department as well as the mayor’s office, and that’s been really exciting. Then Atlanta basically has sworn itself in as being one of the smartest cities in the U.S.
How did Soofa evolve out of your research at MIT? I worked on electric cars in Berlin, together with BMW. It was very clear that when you’re thinking about electric cars, you had to think about the city as well. So suddenly it was: What is the charging infrastructure going to look like? How are we going to change people’s behavior? There were all these super interesting questions. Then I had heard that in the [MIT] Media Lab, they were building a foldable electric car that in the future would be autonomous. I applied to the Smart Cities group at the MIT Media Lab, and one of the things that started happening was I became one of the spokespeople talking about our vision of the future for cities, which had a lot to do with cities that are sustainable, that are walkable, that have vibrant neighborhoods, where we almost come back to the roots. Like why is a city like Paris so exciting? What makes these neighborhoods special? In every neighborhood you have all your retail—you don’t even have to leave your neighborhood to get everything. Within your 10-minute walking distance, you have all the retail you could possibly need; you have community. We really focused in on this vision of walkable, social, smart cities. While I was pitching this idea out there—to the IBMs and GEs and Verizons out there in the world—it became very apparent that when they thought ‘smart cities,’ they thought about software platforms. When I think about smart cities, I think about people. Soofa was really started based out of, ‘Man, there needs to be a company that thinks about the people first,’ kind of like the IDEO for cities—user-centered design. Why when we’re thinking about smart cities are we not starting to think about people like you and me? You live in Brooklyn. What do you do every day? What’s your experience like? Where do you walk by? What information do you need? How can you meet up with your people? How can we make sure you have all the retail that you need? How can we make sure that you also visit other neighborhoods so that you cross-pollinate? All those questions. So Soofa is really an answer to that. Building user-focused, social cities that use technology as a tool to make great communities. In addition to hardware, Soofa offers data analysis. What information does Soofa technology collect, and how have you applied some of the insights from it? The user-centered approach is slowly trickling through to the real estate developers, is what I’m trying to say. So they start offering dog care services or yoga in the park; they build ice rinks in the winter; they put up art installations. They’re really engaged in [catering] to us millennials. A lot of the issues there, though, are how do you actually know what works and what doesn’t work? One of the great things about a website is you create a space, you invite people, and you basically are trying your best to make it a place where there’s traffic. But if you didn’t have any way of measuring traffic to your website, how would you improve? Same with your articles—if you don’t know who reads your article how are you going to know what interests people? The data services that Soofa provides are basically an anonymous way of measuring space activity. That is in our opinion an indicator for, is your event working well or not? Is this retail at the right location? Is the tree lighting in New York City suddenly attracting a ton of people and then do they actually stay and mingle and help the economy in the area? The Soofa Sign is kind of the extension of that; if you see a lot of people came to this event, then you can start advertising on the Soofa Sign other events that are going to take place in that space at that time or at a later time. The way we think about that is almost like the Facebook wall for the neighborhood. It’s focused less on big national brands and more on the local. It’s trying to surface all the goodness that’s happening in your neighborhood. It’s kind of like word of mouth, just powered by solar. What are some of the possibilities for advertising on Soofa screens? One of the things that we’ve been noticing is we’re kind of at this tipping point where advertising made their billboards all faster, greater and stronger; you can see that with the Links in New York—suddenly you have video and audio and touch interface, and you have basically an entire entertainment center on every street corner. We’re kind of taking the opposite approach [at Soofa] where we’re going back to almost traditional event posters. We’re using electronic paper, which allows us to be off-grid, so it’s basically like a gigantic Kindle. We’re focusing a lot more on design and on information, and bringing good aesthetics into the right-of-way. Having your eyes almost rest on the Soofa sign, rather than it being something that’s trying to harass you. Online, we’re taking a step back from pop-up ads and loud, in-your-face advertising, and I think we need to come to the conclusion and reality that we should be doing the same in the public right-of-way. Where brands and advertisers actually care more about the story, content and relevance in that specific moment, rather than a flashing [billboard] that has very little relevance to your day at that specific moment in time because it’s just a brand impression and not a story. What are the ways people can interact with the screen? That’s one of the ways to interact with it; the other is we built an app store so we have multiple different applications around the sign. Some of them are more around amenities: the transit application—when is the next train coming—and also security alerts. Then the other thing is Twitter; we can just go and grab a brand Twitter handle and the latest tweets appear on the sign. It’s only the beginning of a world in which we take back some of our city infrastructure, and we’re very open to working with local brands on what stories to tell. New Balance [for example], if you look at what they do online now, they’re telling stories about running competitions and healthy lifestyles. Those stories are also stories that could be shared in the public right-of-way. So when a brand comes to us and says, ‘I really want to have an integration where someone can vote something up or down, and I want to show those results’—those things are all possible and things that we’re working on together with retail and advertising partners. We’re in a moment where retailers are rethinking physical spaces to emphasize the human element, which you can’t get online, and at the same time integrate tech to improve the customer experience. Based on what you’ve encountered with Soofa users, what would your advice be for creating a successful combination of digital and IRL? My advice would be, again, think through your target audience or your target customer. Try to see them as a partner and someone [for whom] you’re trying to make life better. Technology is never the answer—technology is always just a tool. When I think about being a retailer I would think about, first and foremost, how do I delight my customers? If we’re thinking about brick-and-mortar stores, trying to bring people in and create experiences for them. What could that be? How does that also change over time, so people come in again? You don’t want them just once in your store; you want them over and over again in your store. I think there are amazing brands [doing this]—look at Louis Vuitton in New York City. They have amazing interior design; you want to go in there just to look at their current [display]. I would really encourage retailers to think about how to create experiences first and foremost, and I think events are actually something where brands can really win. They’re temporary; it’s something where you can draw people in and it can be relevant over and over again if you change how you do your events. It also gives you the opportunity to have your brand ambassadors, the people in your store, interact with your customers and really learn from them. We worked with Anheuser-Busch on a larger rollout of [our benches] in Los Angeles where one of our clients was a brewery. They wanted to show their dedication to renewable energy; they wanted to have a new type of beer garden where people can charge up and relax, and where they build an experience for their pubs. It’s not just ‘Come on in’ and then selling a bottle of beer. It’s ‘Come on in and I’m going to give you the best and most fabulous Saturday you’ve ever had.’ Again, Soofa technology is not the solution—it’s a part of the fabric that helps create those experiences that draw people in, and then you have stories to tell.